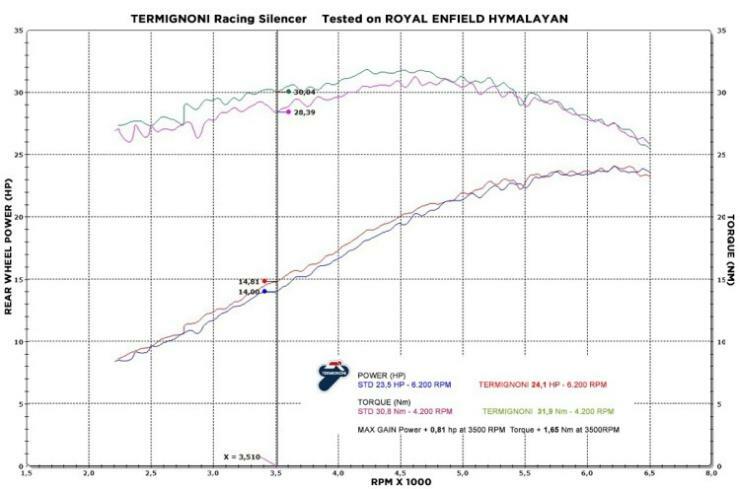 The Royal Enfield Himalayan 400 ADV motorcycle has just received a new accessory from Italian exhaust specialist, Termignoni. The Himalayan is the only Royal Enfield for which Termignoni makes an after market exhaust. The gains due to the new Termignoni exhaust are modest at best. Peak power goes up by 0.8 Bhp while peak torque gets a 1.65 Nm boost. The exhaust is priced at a hefty 370 euros, which translates into nearly Rs. 30,000. The sleek looking exhaust is made of stainless steel, and is lighter than the stock unit by 2 kilograms. It must be noted that after market exhausts are meant only for off-road use, which also means that they’re illegal when used on public roads. The stock Royal Enfield Himalayan features a 411-cc, four-stroke air-cooled engine with 24.5 Bhp-32 Nm outputs. The fuel-injected engine gets an overhead camshaft, an external oil cooler and has a long stroke design. A 5-speed manual gearbox is standard. The motorcycle gets long travel front and rear suspension, and a mammoth 220 mm of ground clearance. The telescopic forks at the front gets 200-mm travel, while the rear monoshock gets 180-mm travel. The Himalayan rides on a 21-inch front wheel and a 19-inch rear wheel. The motorcycle gets a high seating position, and a windscreen to prevent wind blast for the rider. The Himayalan rides on on-off road tyres with tubes, and features disc brakes as standard on both wheels. However, ABS is not yet offered in the Indian market. 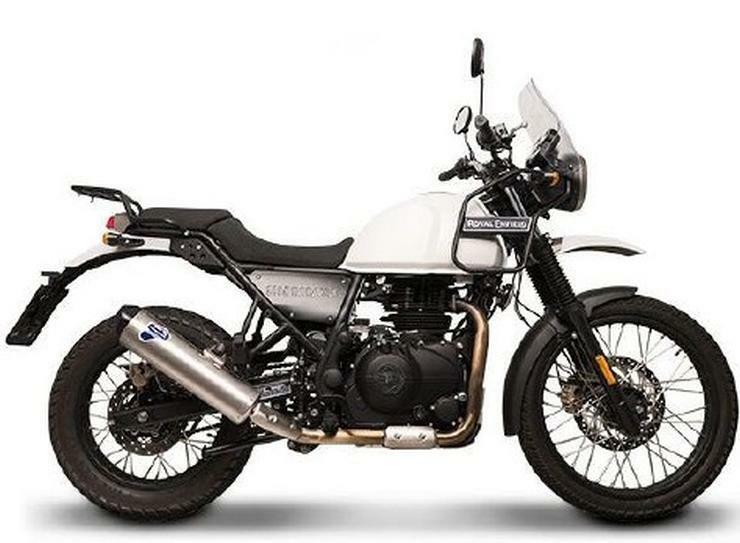 In markets abroad, Royal Enfield sells the Himalayan with dual-channel ABS as standard. ABS is expected to make it to the India-spec Royal Enfield Himalayan 400 by April 2019, when government regulations make ABS mandatory on all 125 cc+ motorcycles sold here. Notably, the Himalayan 400 now sold in India is a much improved V2.0 version. The newer version is said to be a lot more reliable than the first gen model. Prices of the Himalayan start from Rs. 1.68 lakh, ex-showroom Delhi.